For the town in Germany, see Ahrensburg. For the village in Tarvastu Parish, Viljandi County, see Kuressaare, Viljandi County. "Kingissepa" redirects here. For the town in Leningrad Oblast, Russia, see Kingisepp. Kuressaare (Estonian pronunciation: [ˈkuresˑ'sɑːre]), also known as Arensburg, is a town and a municipality on Saaremaa island in Estonia. 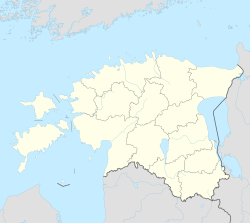 It is the capital of Saare County and the westernmost town in Estonia. The recorded population on 1 January 2018 was 13,276. ^ a b c Bes, Lennart; Frankot, Edda; Brand, Hanno (2007). Baltic Connections: Denmark, Estonia, Finland, Germany. BRILL. p. 178. ISBN 978-90-04-16431-4. Retrieved 4 June 2012. ^ Kjaergaard, Thorkild (1994). Castles around the Baltic Sea: the illustrated guide. Castle Museum. p. 64. ISBN 978-83-86206-03-2. Retrieved 4 June 2012. ^ Murray, Alan V. (2001). Crusade and conversion on the Baltic frontier, 1150–1500. Ashgate. p. 11. ISBN 978-0-7546-0325-2. Retrieved 4 June 2012. ^ a b c d Taylor, Neil (17 August 2010). Bradt Estonia. Bradt Travel Guides. p. 255. ISBN 978-1-84162-320-7. Retrieved 4 June 2012. ^ O'Connor, Kevin (2006). Culture And Customs of the Baltic States. Greenwood Publishing Group. p. 207. ISBN 978-0-313-33125-1. Retrieved 4 June 2012. ^ Jarvis, Howard; Ochser, Tim (2 May 2011). DK Eyewitness Travel Guide: Estonia, Latvia & Lithuania. Dorling Kindersley. p. 32. ISBN 978-1-4053-6063-0. Retrieved 4 June 2012. ^ Lang, V.; Laneman, Margot (2006). Archaeological research in Estonia, 1865–2005. Tartu University Press. p. 185. Retrieved 4 June 2012. ^ "Kuressaare sõpruslinnad". Kuressaare linn. Retrieved 21 October 2010.